I had these Jasper leaves for a couple of years without knowing what to do with them. 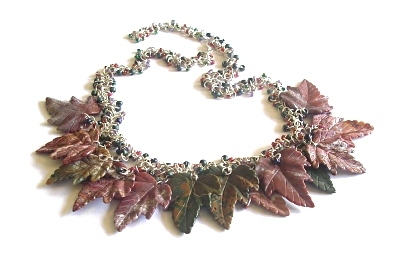 I didn't want to use beadwork as I didn't want to distract from the beautiful patterns on each leaf, and I didn't want to just use wire or chain maille as I felt they needed some colour to show them off to their best. So I got my beads and jump rings out and played until I realised that a combination of shaggy loops with mixed ring sizes as well as different bead sizes and colours gave me the finished look I wanted. Shaggy loops is a simple chain that I teach as part of my Chain Maille class as a reward for getting through the harder chains!